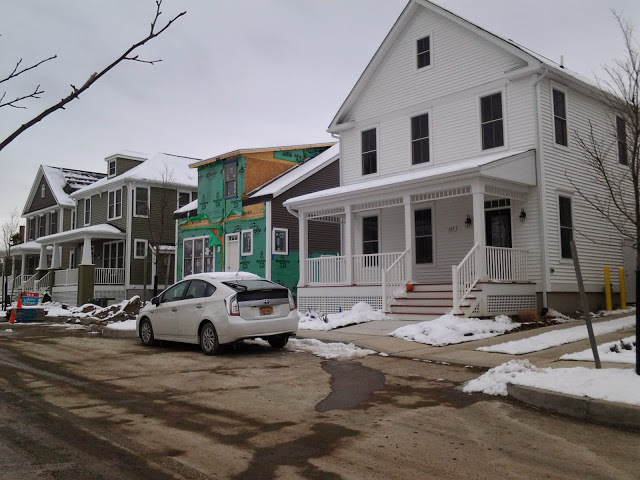 Over in Belle Sherman, work continues on its namesake housing development, the 29-unit Belle Sherman Cottages. 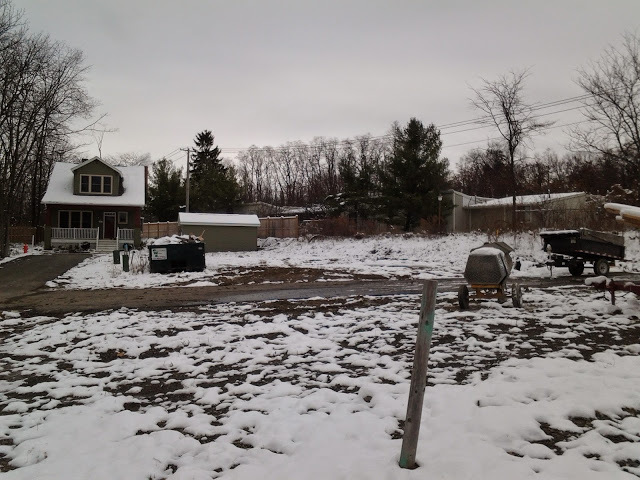 From a glance, some site clearing might be taking place for the first set of five townhouses (lots 25-29), which are aiming for an April 2015 completion. 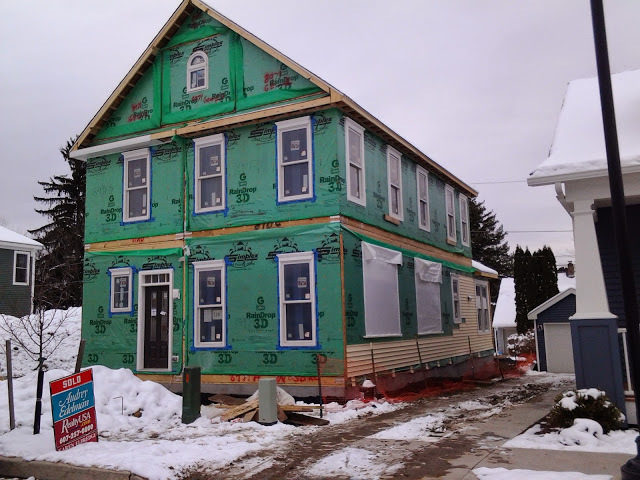 Several homes are in various stages of construction, with some still wrapped in breathable plastic, and others undergoing final exterior and interior work. 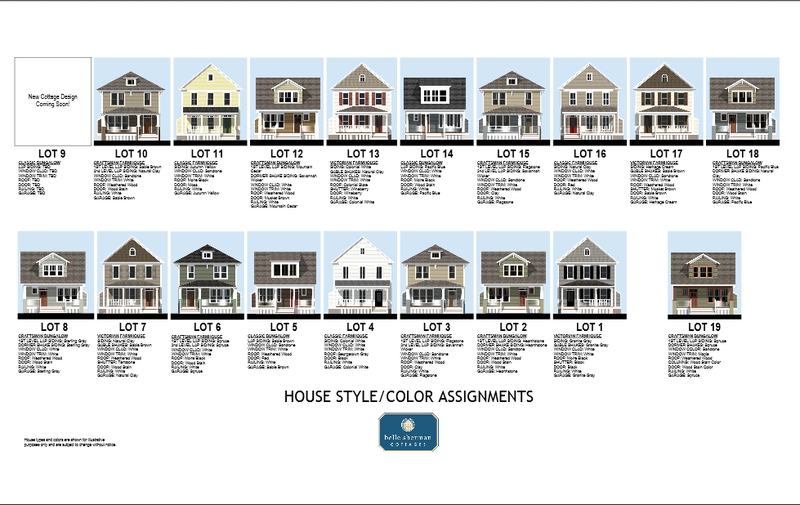 Since September, lot 18 (Craftsman Bungalow), lot 15 (Craftsman Farmhouse), lot 10 (Craftsman Farmhouse) and lot 3 (Craftsman Farmhouse) were completed or are nearly completed, while lot 17 (Victorian Farmhouse) and lot 5 (Classic Bungalow) are underway. That’s six houses in less than three months. 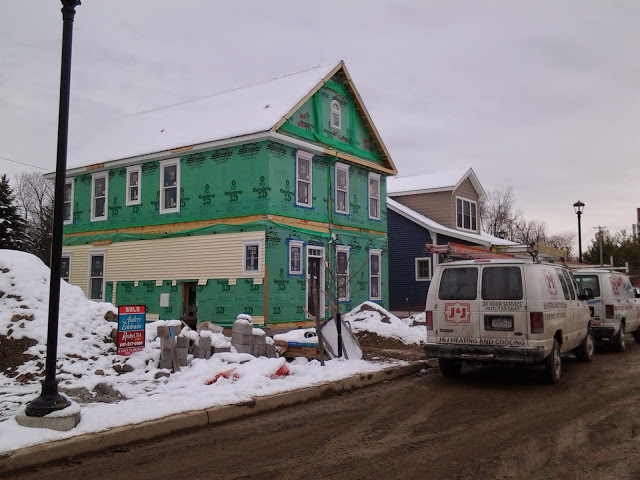 Carina Construction and Agora Home and Development more than outdid my September estimate of 1-2 more homes before the end of the year. 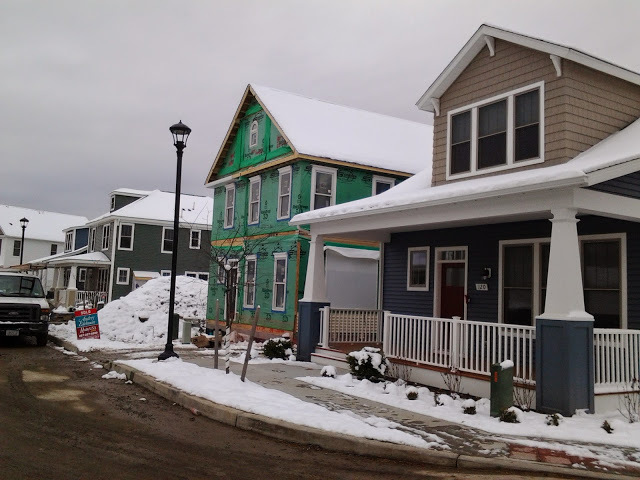 For comparison’s sake, in December 2013, there were five complete houses and two more underway, and the model house was built all the way back in May 2012. Now the total number of homes built or being built is 14. The project had a great sales year and it shows. 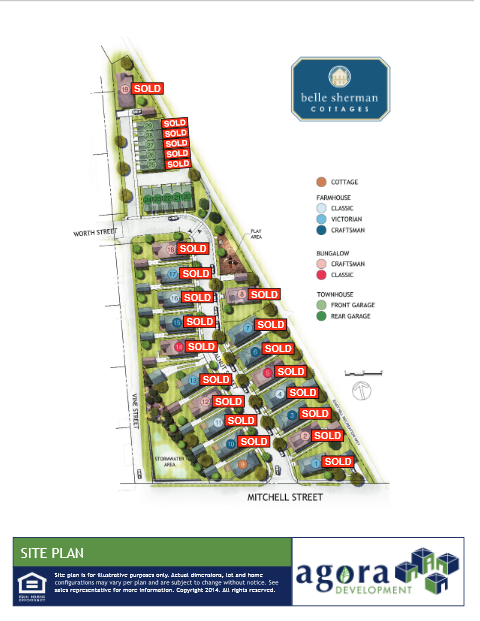 Speaking of sales, all houses except lot 9, a new design yet to be published, have been sold. 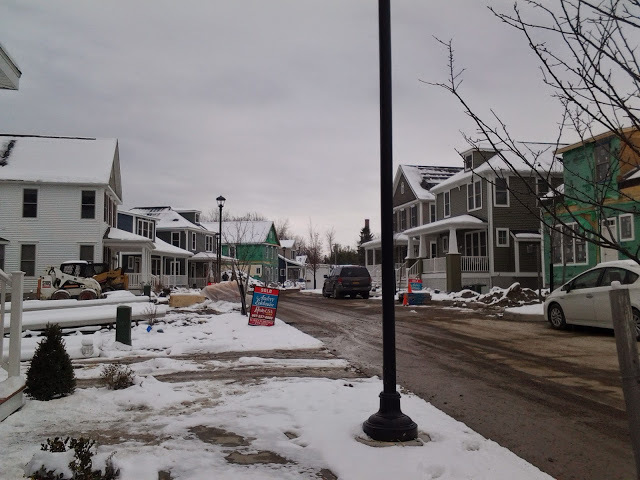 All 5 units that comprise the first set of townhouses have sold as well. 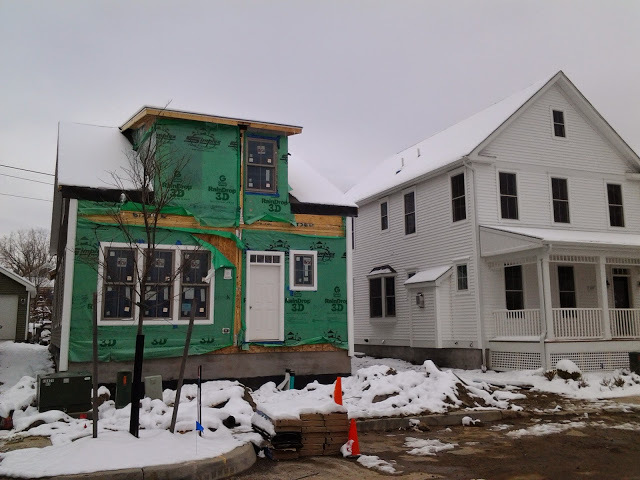 Marketing has not begun for the 5 units in the second set of townhouses, lots 20-24. 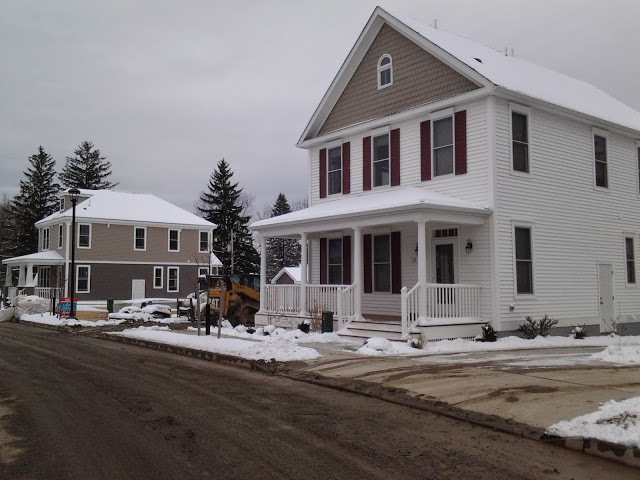 One of the unique features of this project is that unlike traditional on-site frame construction, these houses are assembled from modular units. 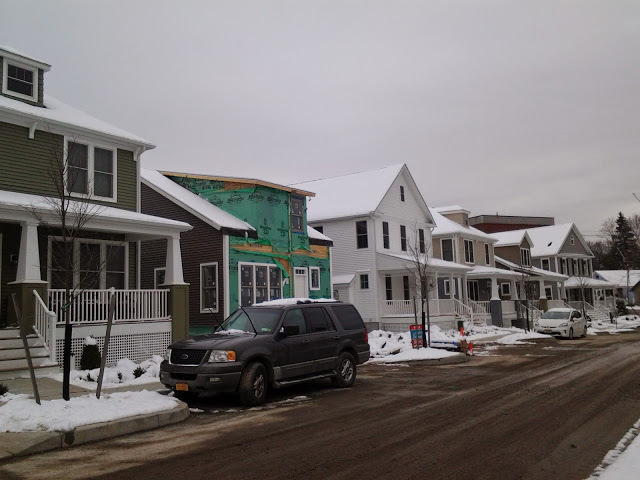 The modular pieces are sourced from Simplex Homes in Scranton and trucked up to Ithaca for installation. Once the concrete block foundation has been assembled, the four modular pieces for each home are craned into place, and once the pieces are leveled with the rest of the structure, the adjoining walls and ceiling are secured with steel plates. 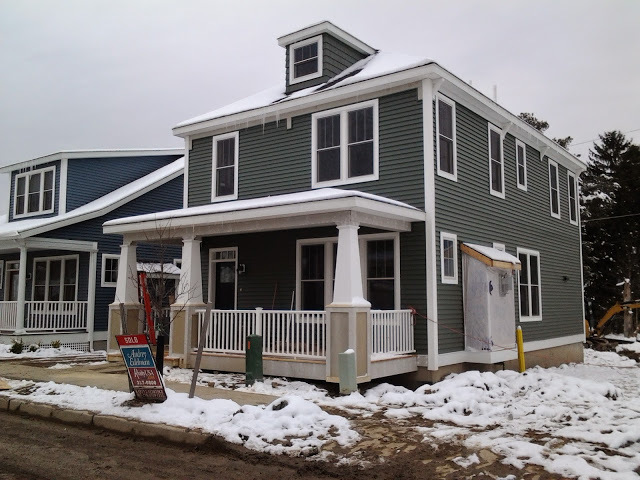 Interior work goes on while siding, porches and other features are built onto the assembled house. This allows for a faster construction process and cuts down on finishing costs.